Cambridge Pads has created this average rent price infographic with information from the Boston Pads database. This resource is for landlords and renters to understand the rental market in Cambridge, MA. 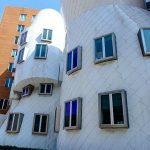 The extensive Boston Pads database holds 156,000 Boston apartments, over 500,000 apartment photos, 11,000 apartment videos, and contacts with more than 16,000 local Boston landlords. The average rent was calculated using 683 Cambridge apartments that are currently available, or that were recently rented up to 12 months ago. Cambridge Pads calculated the real time vacancy rate by adding up all the apartments currently available and those that will become available in the upcoming months, then dividing by the total number of apartments for Cambridge in the database. Population and household income data was gathered from the US Census Bureau. In Cambridge, average rent prices are among the highest of any of the cities and towns studied outside of Boston. 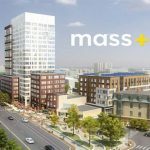 For 2-bedroom, 3-bedroom, and 4-bedroom apartments, renters pay over $550 more per month to live in Cambridge compared to average rent prices in Somerville, another expensive Boston suburb. Likewise, compared to average rent prices in Allston, rent in Cambridge is much higher. A typical renter pays $400 less per month, on average, for a 1-bedroom in Allston versus a 1-bedroom in Cambridge, $700 less for a 2-bedroom, and roughly $1,000 less per month for a 4-bedroom or 5-bedroom apartment. For apartments of all sizes, Cambridge ranks in the top 10 most expensive places to rent out of the 22 areas sampled. 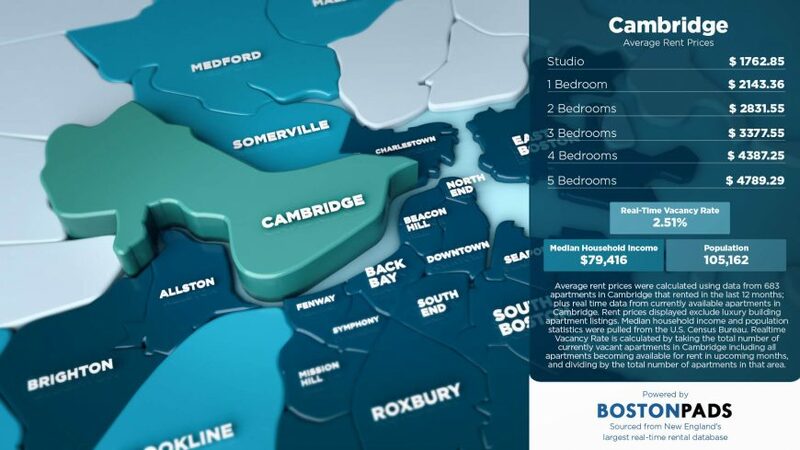 For studio apartments, Cambridge ranks 5th highest at $1,762 per month. For 1-bedroom apartments, it ranks 7th highest, and 6th highest for 2-bedroom apartments. Cambridge Pads is powered by the Boston Pads database. Renters, landlords and property managers alike can access this data through a professional phone staff or licensed real estate agents using the Bostonpads.com system, seven days a week. Landlords can get a snapshot of the rental market in any neighborhood, with information such as current rent prices, vacancy rates, trending topics, and more. Boston Pads utilizes this data to assist local landlords in optimizing rental income and reducing vacancy times. It is this locally focused and data centered approach that has helped Boston Pads build their network of Greater Boston landlords to over 16,000 strong. Landlords who list with Boston Pads ensure themselves the best marketing coverage from one centralized location. Boston Pads listings are posted to almost every national platform including Zillow, Craigslist, and Trulia, over 80 locally optimized real estate listing websites, and 100+ local social media pages on Facebook, Twitter, and YouTube. By combining the most comprehensive marketing with the strongest data, Boston Pads has distinguished itself as the real estate and information technology leader in New England. Their platform is scalable and adaptable to any market, and can be used by any agency or landlord to gain access to marketing and real estate tools that can help them rise above their competition.